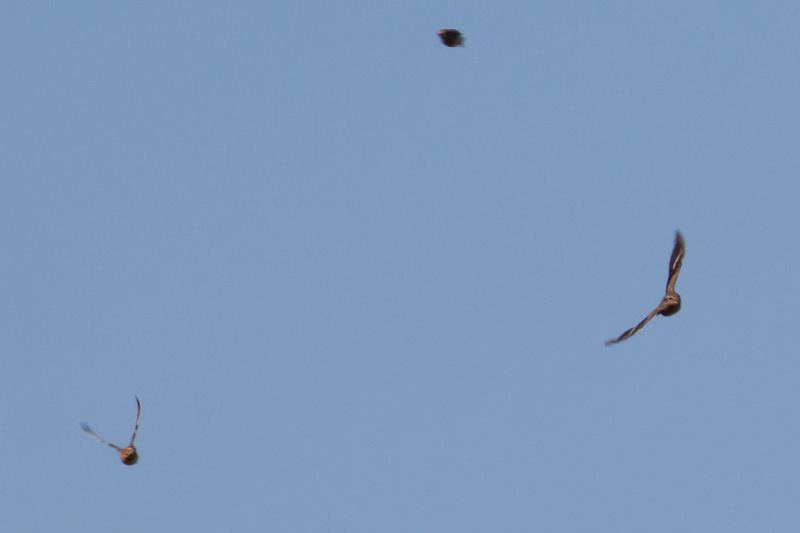 Fall birding is blowing up. White-crowned and Golden-crowned Sparrows have returned to the yard singing “oh deear mee” making me so happy. 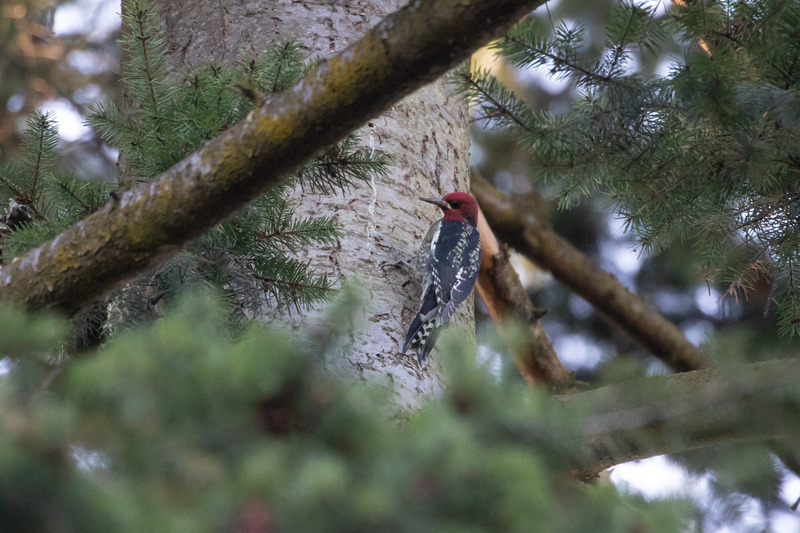 I was also finally around to see a Red-breasted Sapsucker that I’ve only recorded in the yard once three years ago (!). I might have jumped up and down. Or I would have except I’d had a little ankle setback after overdoing it on Mt Tabor. Not ready for steep hill-work yet I guess. Luckily the hottest birding spot lately in Multnomah County, Force Lake, is a flat drive-up pond. 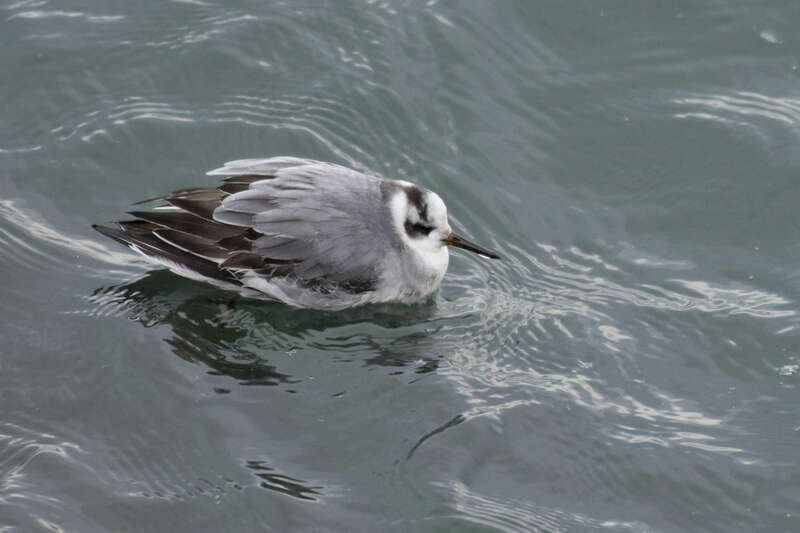 Not known for being the best water system, past the “do not eat the fish” signs, the water levels have been favorable enough for a (usually pelagic) Red Phalarope. 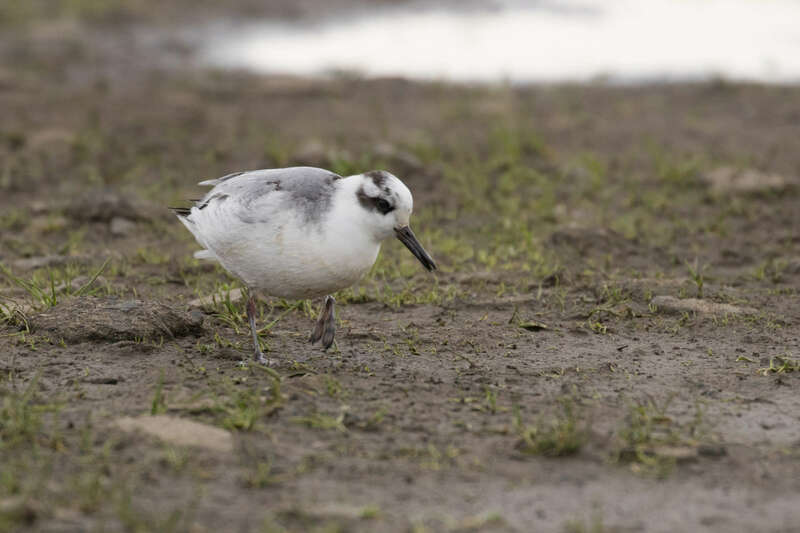 More typically Red-necked Phalarope occurs inland, but this molting adult bird has more red in the back and a thicker bill with (subtle bit of) yellow at the base. 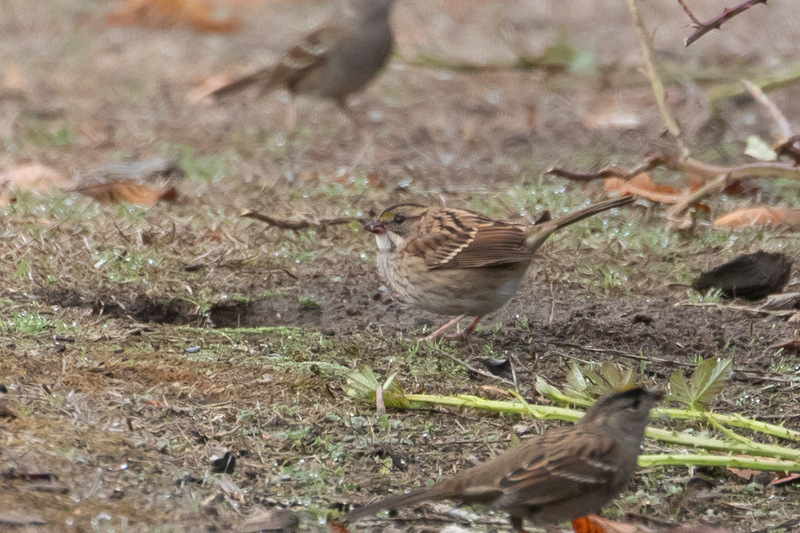 I was also excited to find my FOS (first of season) White-throated Sparrow here mixed in between Golden-crowned Sparrows. 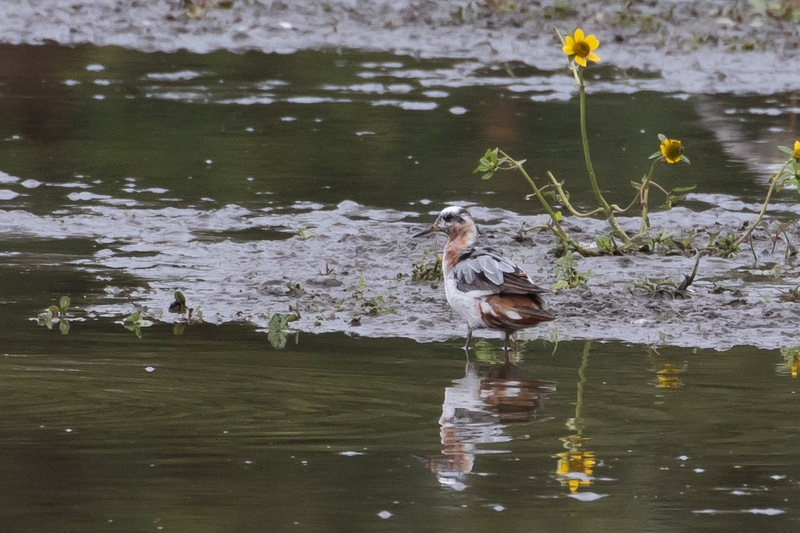 Less than a week later a new birder photographed (but misidentified) a Ruff at the pond. 7 months into birding I wouldn’t have been able to identify a Ruff either, but word got out about this significant sighting. Which is why I made several attempts to refind the bird. 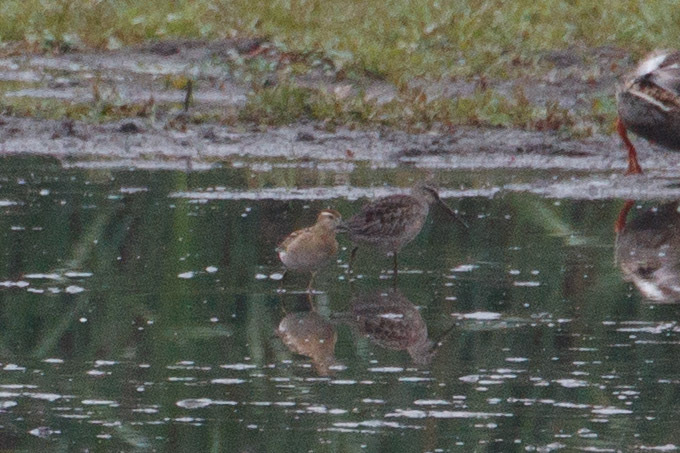 On my second try while scanning the far pond shoreline in near darkness I was rewarded with an even more rare bird, a Sharp-tailed Sandpiper! 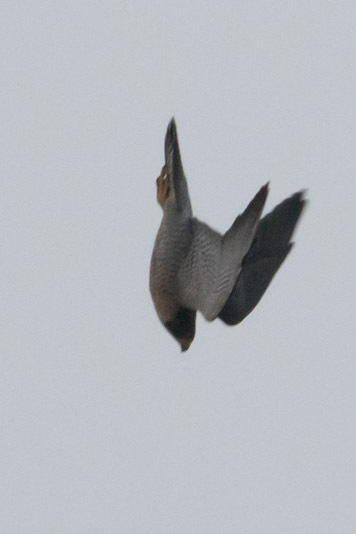 Not great photos since it was so far and so dark, but the pale supercilium (eye-brow) and red cap is visible. It think it lit up in the darkness. 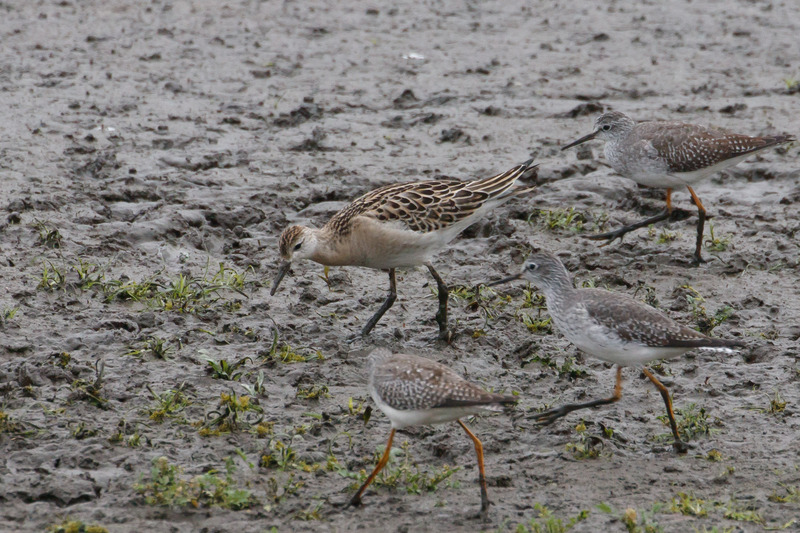 And it’s not a Ruff because it has a smaller bill and is smaller than the Long-billed Dowitcher it’s standing next to. This pond is bananas. It’s amazing what little it takes to support a good variety of species. 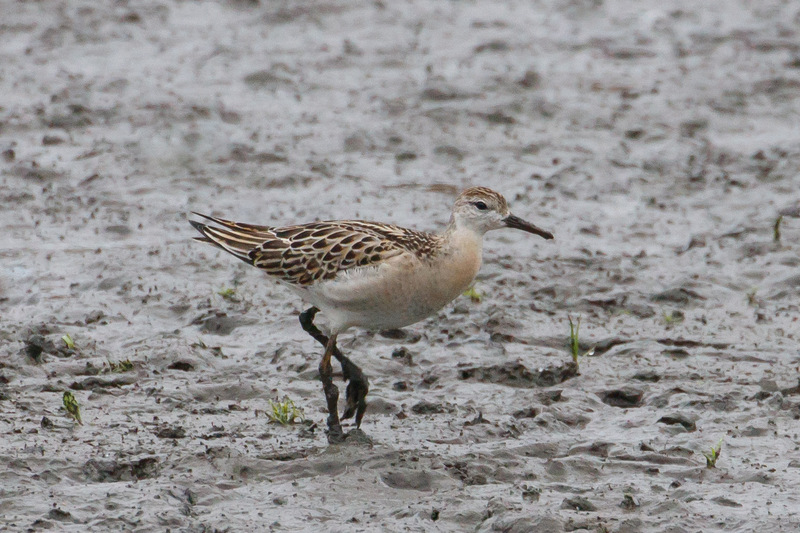 And finally fifth time was the charm for finding the Ruff! This time, at dawn I picked out the buffy shorebird in the scope as the sun came up. Early worm gets the bird. I put the word out and a handful of people made it to the pond to enjoy looks at the Ruff before two adult Peregrine Falcons swooped in scattering all the shorebirds while about 20 birders’ jaws dropped (in horror and amazement). The falcons hunted together cornering a LEYE but came up empty in the end. And that was the end of the Ruff show. In other news, my dad’s moved to Newport, OR. Say what?! 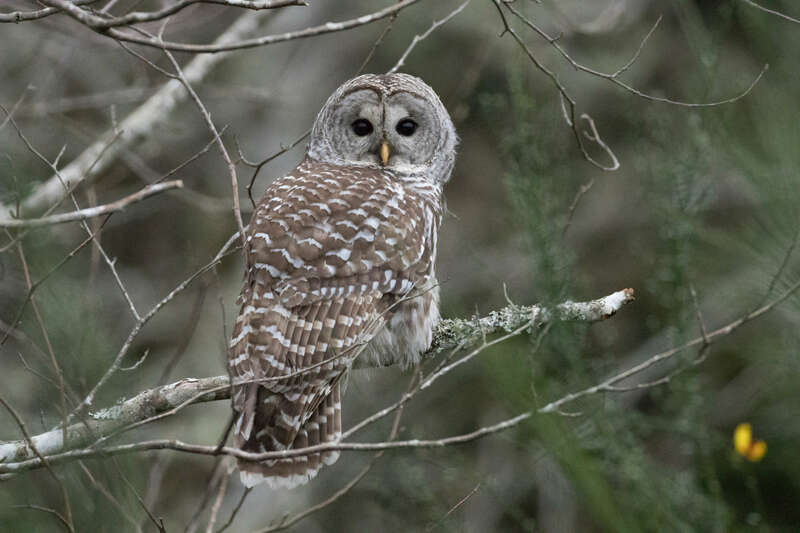 He said goodbye to Limpkins and Eastern Screech Owls and hello to Oregon’s coastal birds. I’m not sure that’s a fair trade. 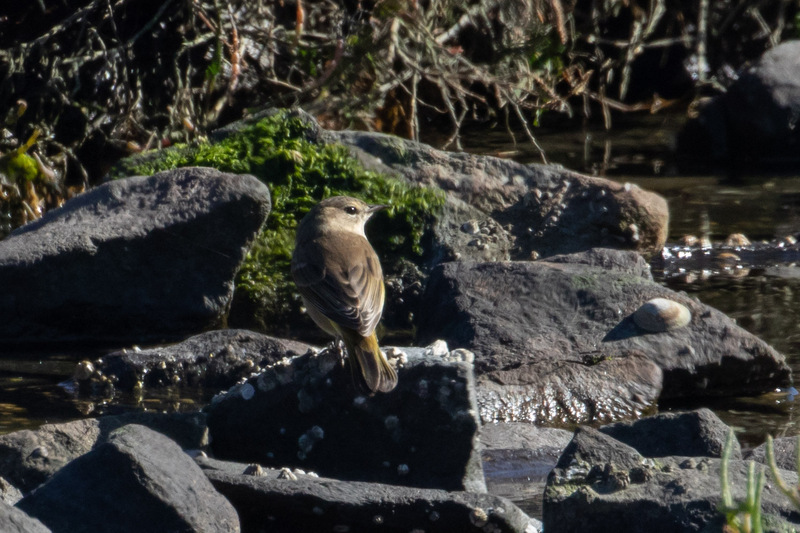 I delivered some boxes to him, and together we looked for a Palm Warbler that was exciting to everyone in Newport except him (Florida is spoiled in Palm Warblers). It took a few tries, but eventually we found one. 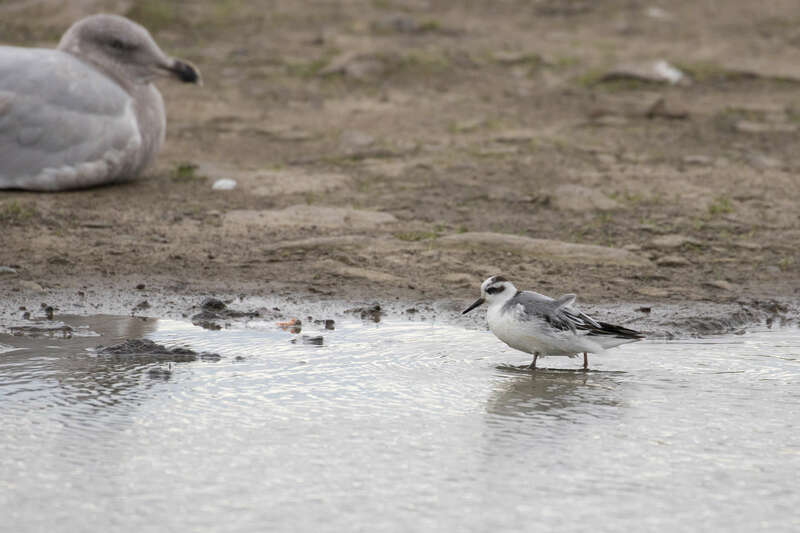 What Florida doesn’t have is Lapland Longspurs and lucky for us we found one of those too at the gull pond at South Jetty. 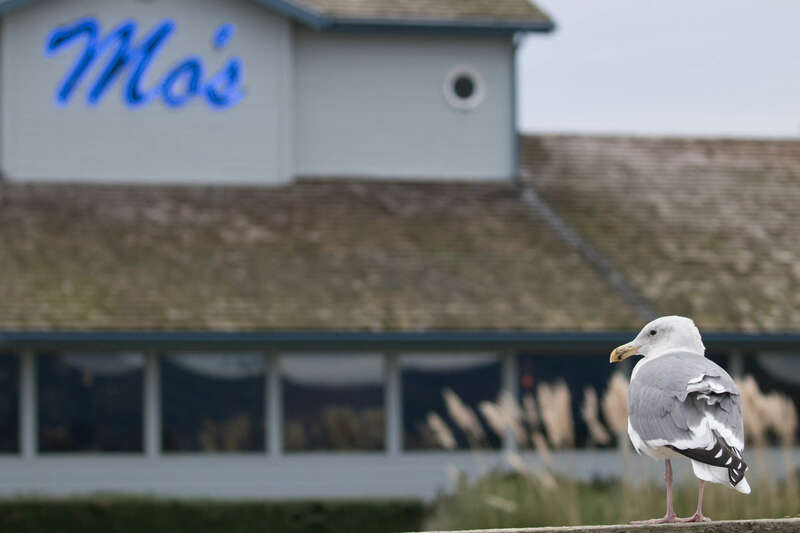 They nest in the arctic tundra and winter in open fields and beaches in some parts of Oregon. They are so pretty! On the drive home from Newport I made three lazy attempts to find a Northern Shrike since this would put me at 295 Oregon birds for the year and for some reason I think it’ll be fun to try for 300 species. But I shriked out. 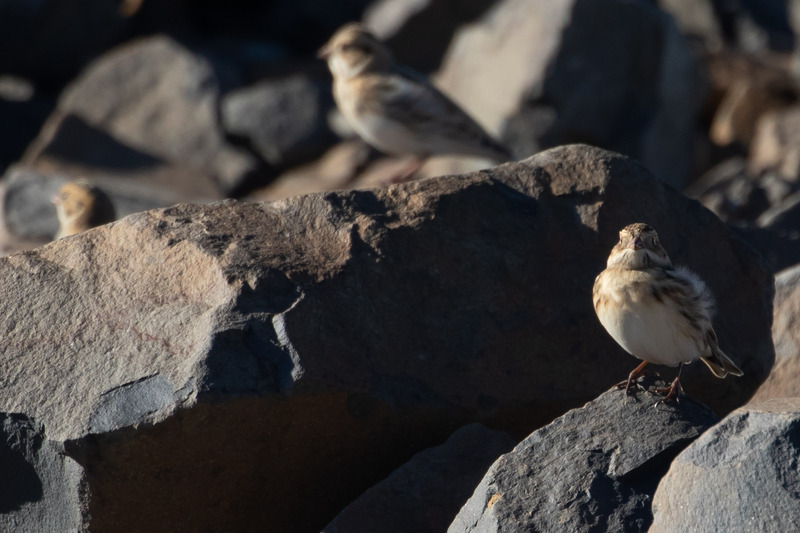 Luckily Sarah, Max, Eric and I took a trip to Fort Stevens State Park the next day to look for a large flock of longspurs which we found easily when they flew. And watched as they disappeared in the grass. Occasionally they perched on the jetty rocks for better looks. 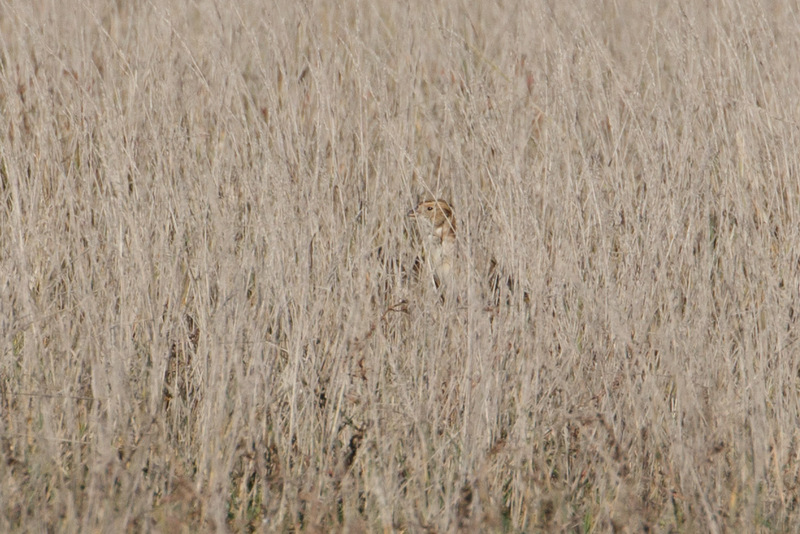 As we were leaving, Sarah spotted an accipiter perched across the grassy field. I saw a distant bird-lump too and was confused when she set the scope up in a different direction. Hmm. Wait. 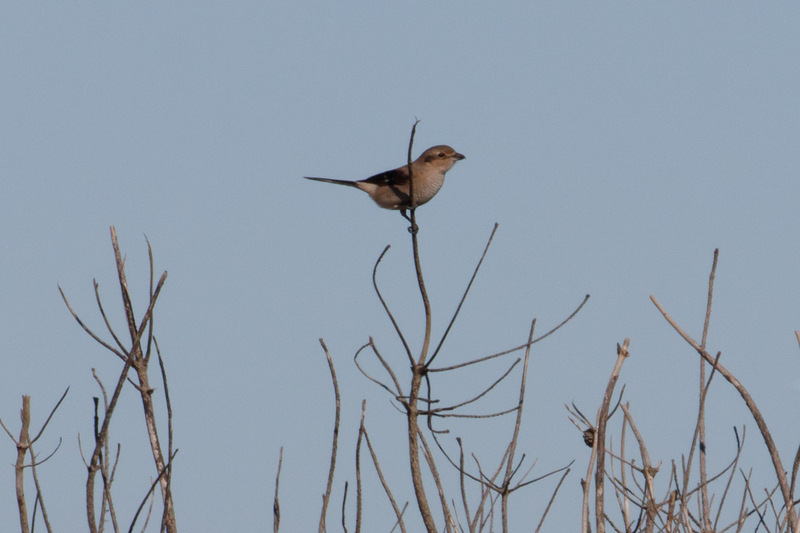 I took a distant photo and got excited when I realized this was a shrike! I only had to stop looking for them to find them. Oregon year bird #295! Northern Shrike. 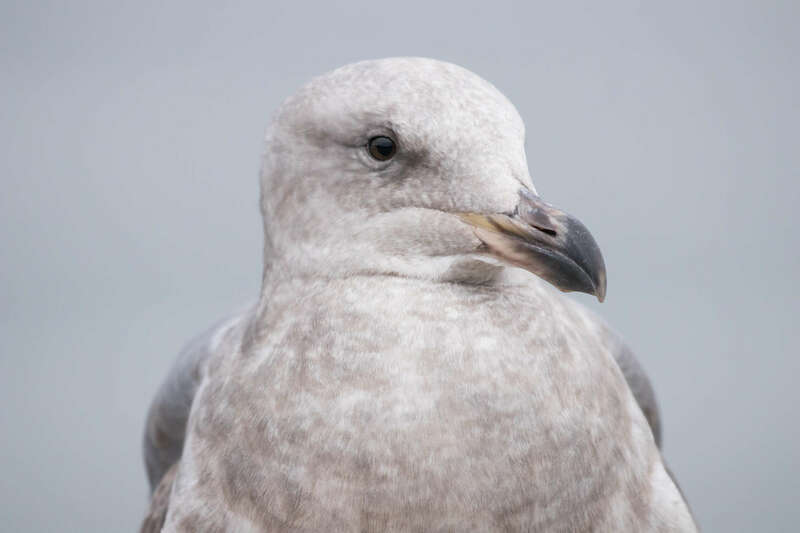 This is a young bird as it’s darker than the bright white/black/gray of an adult. 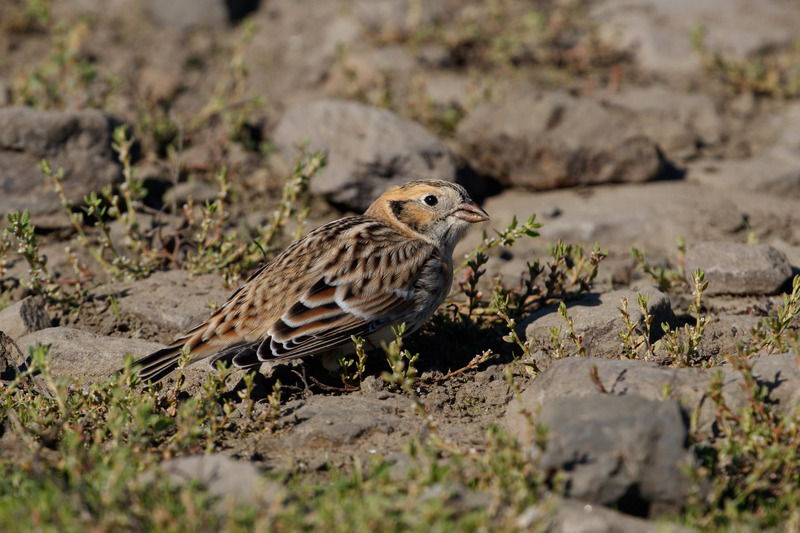 We walked the trail to get closer looks, and saw the shrike go after insects and dragonflies, and then it went for the Lapland Longspurs! Nooooo! It chased the flock unsuccessfully. Until the flock chased it back. 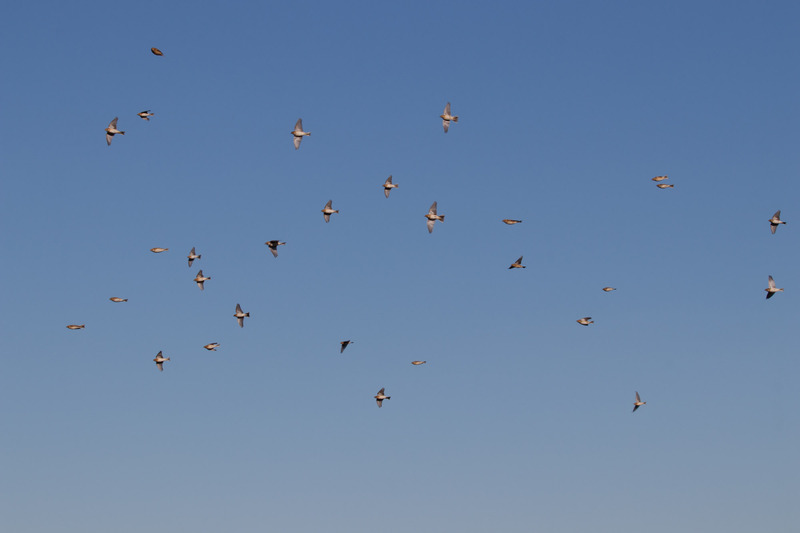 Longspurs flying over. Defeated shrike perched on shrub. Fall birding, am I right? By late afternoon it was time to celebrate a good day of birding over beers and lunch. More of this please. In these crazy times, I’m trying hard to focus on the good stuff. Like going outside and taking in the joys of nature. And birds. 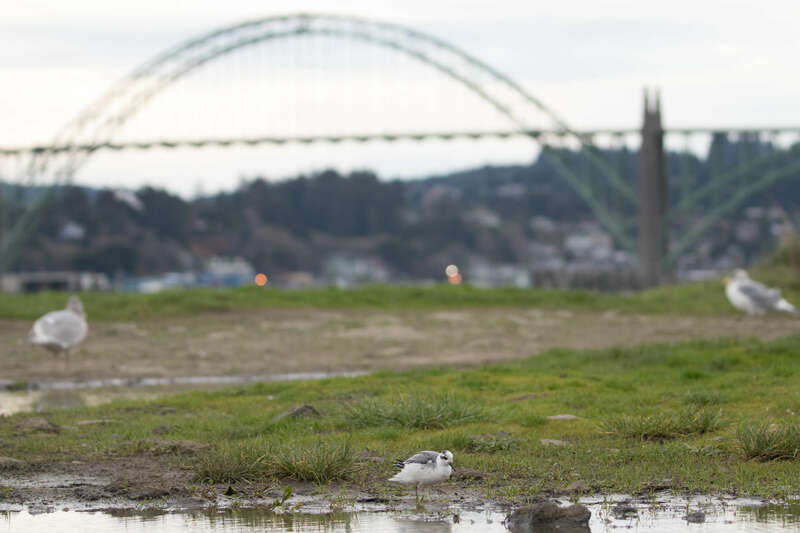 It’s pretty amazing this courageous (and/or incredibly lost) sea duck made it all the way to Oregon. What’s even more amazing is someone was able to identify it. Even still, I struggled with the decision to chase it. The bird showed up on a Sunday. The mental games started immediately. I weighed the pros and cons of taking off work, driving five hours round-trip, with the chance the bird would still be there. I waited a day. The bird stayed. I waited another day while I read the glorious sightings and sat at work debating, and looking out the window at the sunshine. By Friday, the bird was reliably (!) still there and I couldn’t take it anymore. Seems so easy! So I skipped work last-minute, took the gamble, and headed to the coast. I arrived at Mo’s bright and early. Then I turned around and looked out to Siletz Bay where I saw the same thing many others did when first seeking the Code 5 rarity. 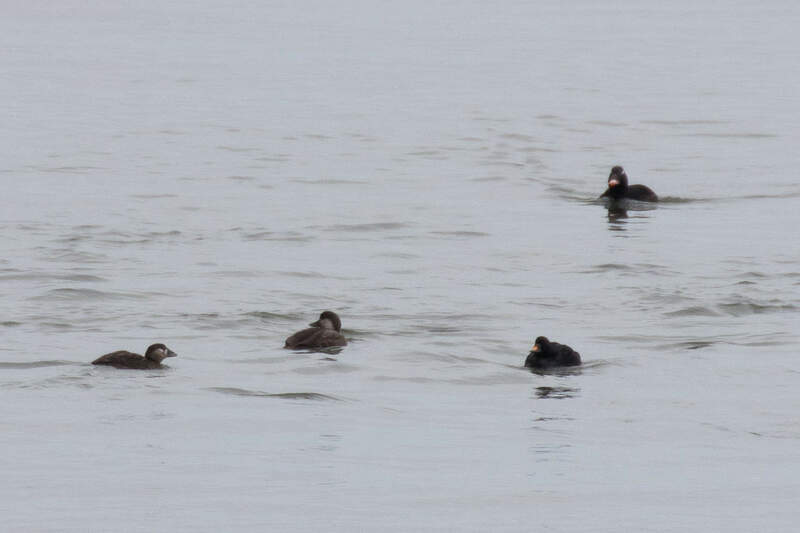 A smattering of sleeping scoters. Not the most exciting introduction to the rarest bird I’ve ever seen. I watched and waited at the dock with one local birder and another man who flew in from Minnesota to see this bird. After a couple of hours waiting and nothing but many (albeit decent) gull pictures to show for it, I chanced leaving to get more coffee and to see if I could find a Red Phalarope or two. 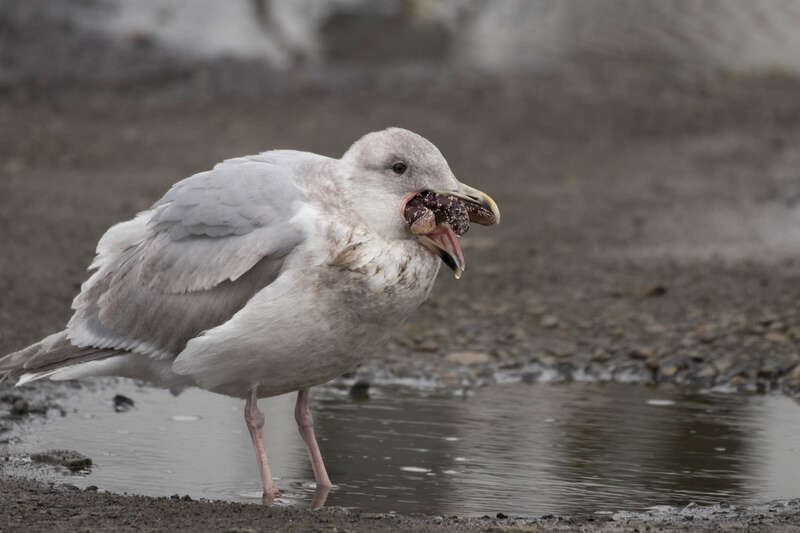 I’d only seen them once before on my pukey-pelagic trip last October, and for some reason these birds that typically “migrate and winter in small flocks on open ocean” and are “rarely seen from land or at inland lake-shores and ponds,” have been spotted all along the coast and even farther inland in the valley. Even on golf courses and in parking lot puddles. 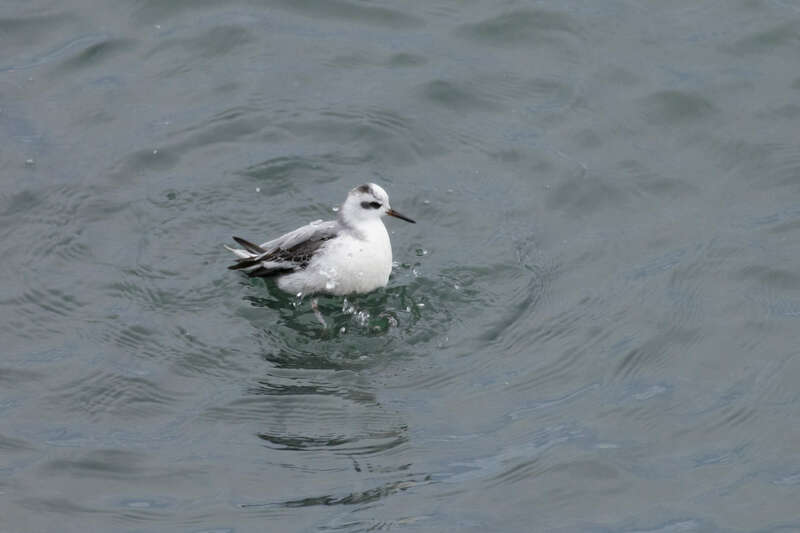 It’s a phalarope-phenomenon. Indeed I phound two at the South Jetty in Newport. Gah. I headed back north to the rare bird. The tide was up and so was the bird! And more birders had arrived on scene, including my friends, Sarah and Max, and another couple who’d driven down from Seattle. 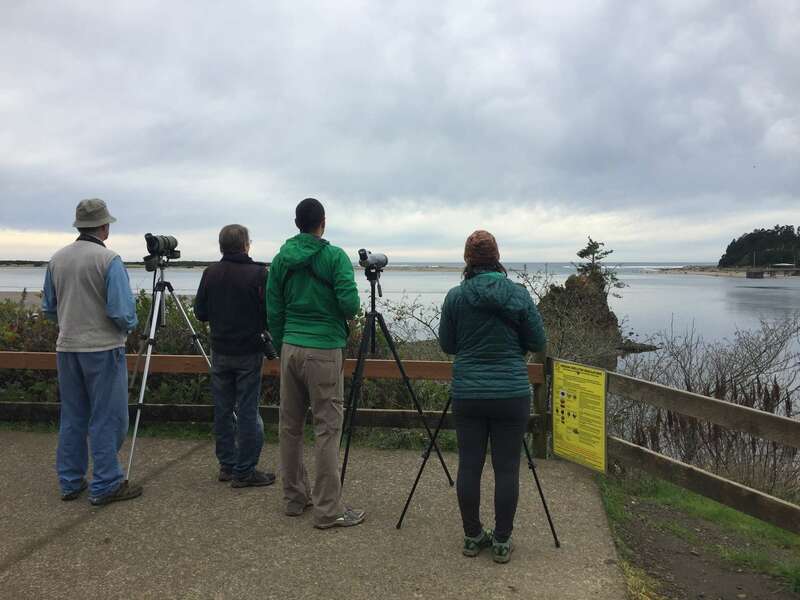 Collectively, we watched the Common Scoter feed near the rocks, and I was thankful for the shared scope views because it was still a pretty far vantage point. But it was awake! And identifiable! All dark black plumage, black knob at the base of the bill with a narrow orange patch in the center. Success! 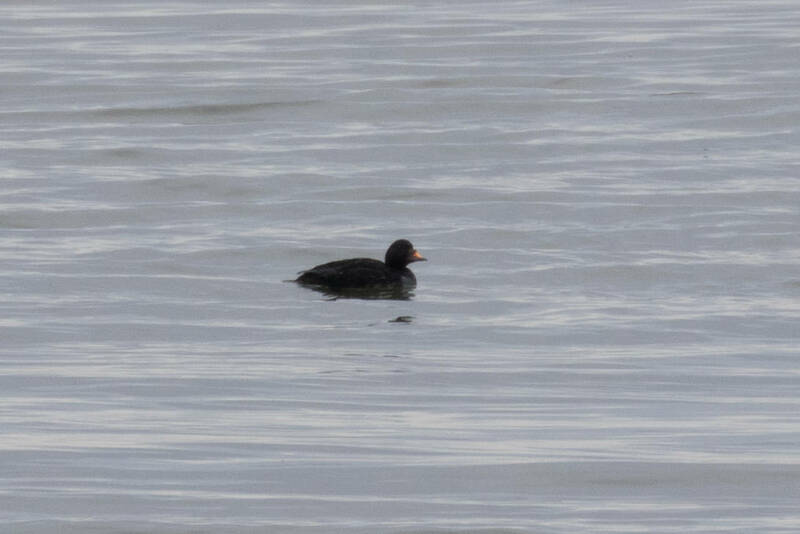 It was seen with its regular female friend, Black Scoter (pic below). 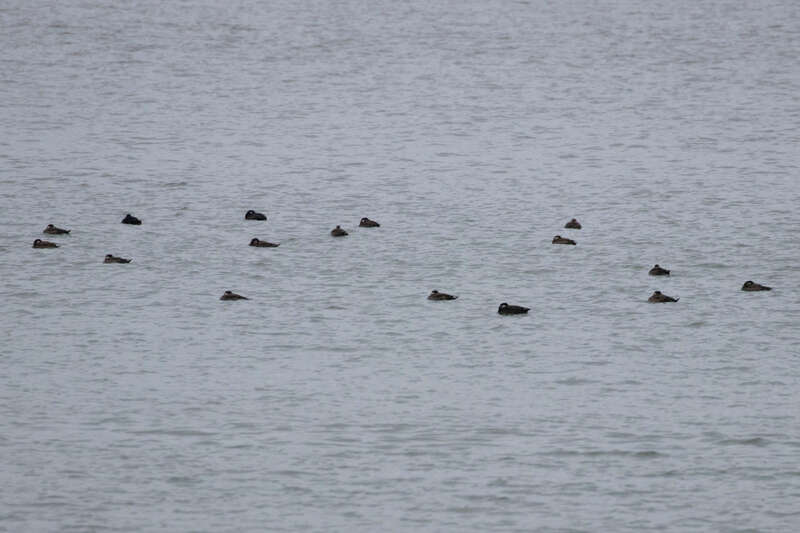 And several other scoter species. Not sunny close-up views, but not a dip either. 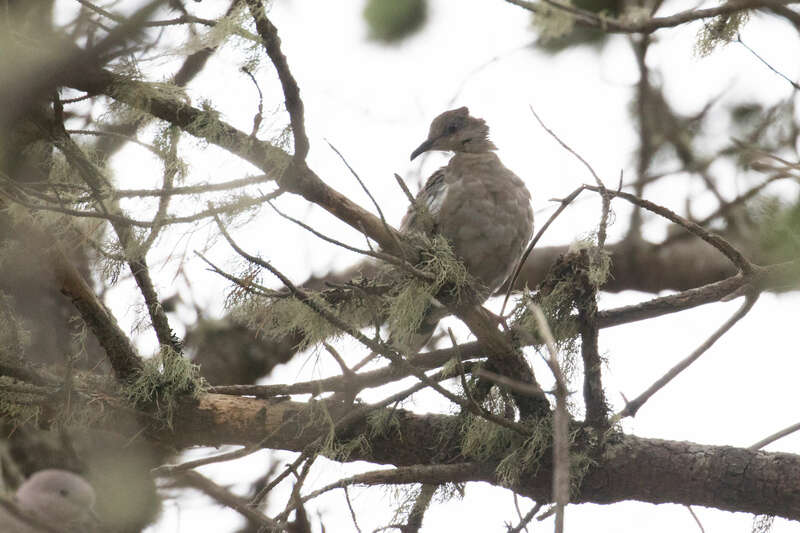 I watched until moderately satisfied before deciding to drive south to Yachats for another reported rare (for the area) bird, a White-winged Dove. 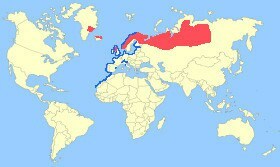 I thought it would be easy, but the only doves I could find were Eurasian-collared and Mourning. That is until Sarah and Max arrived! Good timing. 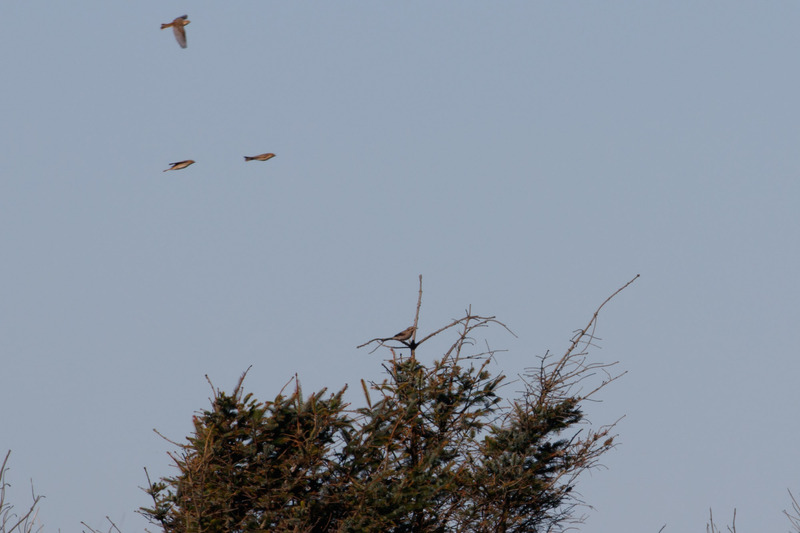 Together we were able to come up with the target dove nestled in the shadowy limbs of a pine tree. Darker than the Eurasians, and with a long thin bill, it looked a bit ragged (but it had traveled from pretty far southeast). With two rare birds under my belt, I was half tempted to drive another 2 hours for a Chestnut-sided Warbler in Eugene, but the winter skies turned darker and I decided to give the scoter a third try for better looks. 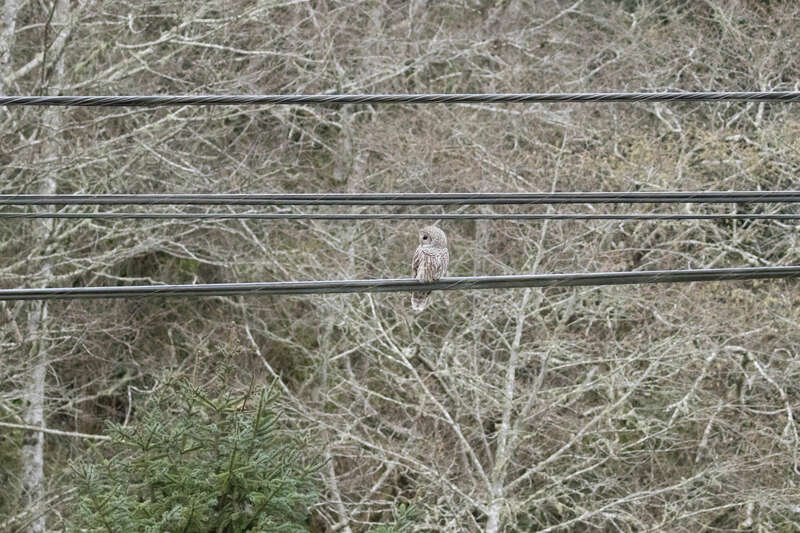 While driving back towards Siletz Bay along HWY 101, I spotted a large bird on the telephone lines. 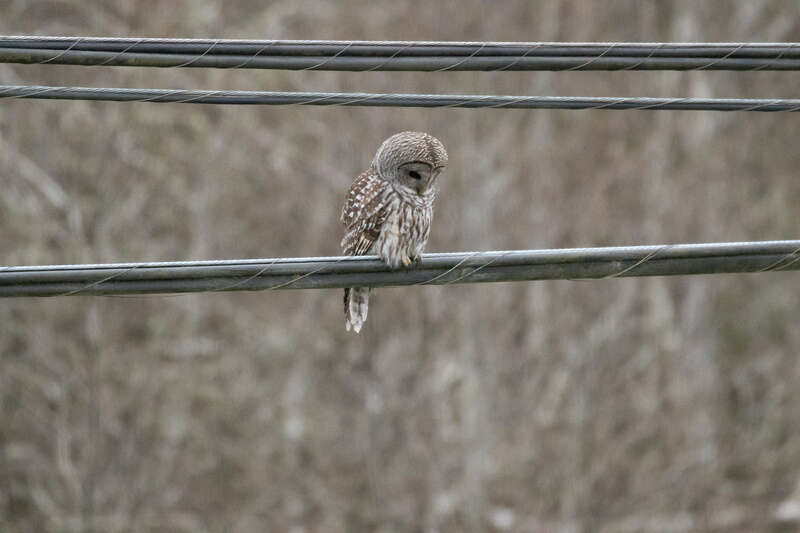 I quickly made a U-turn and pulled over then watched the owl hunt from the lines before it eventually flew down to some tree branches right next to the car. 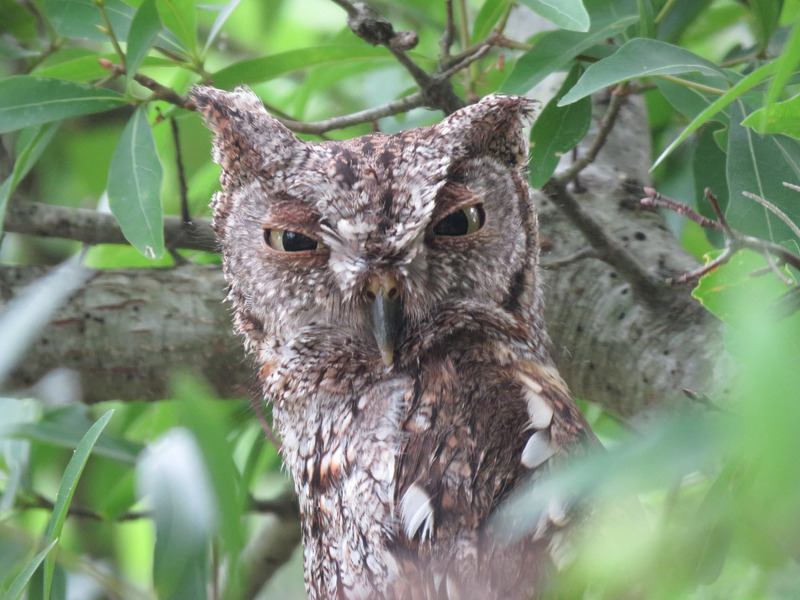 Seeing this owl was a nice surprise ending to my trip. 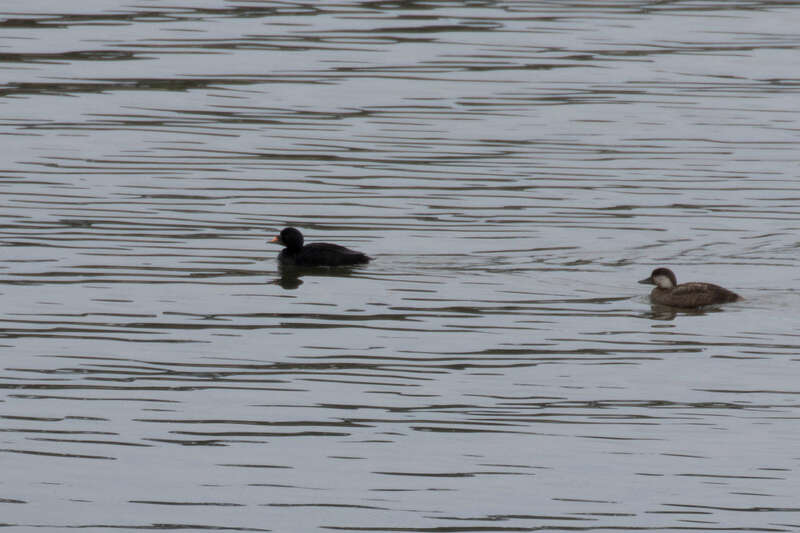 The Common Scoter was still stubbornly far away, but I was thankful for all that I got. Thankful for all the good stuff.